Read-it-later application adds features that make it a solid alternative to apps like Pocket, Paper, and Instapaper. Back in 2014, I wrote about wallabag, an open source alternative to read-it-later applications like Instapaper and Pocket. Go take a look at that article if you want to. Don't worry, I'll wait for you. In the four years since I wrote that article, a lot about wallabag has changed. It's time to take a peek to see how wallabag has matured. The biggest change took place behind the scenes. Wallabag's developer Nicolas Lœuillet and the project's contributors did a lot of tinkering with the code, which improved the application. You see and feel the changes wrought by wallabag's newer codebase every time you use it. So what are some of those changes? There are quite a few. Here are the ones I found most interesting and useful. Besides making wallabag a bit snappier and more stable, the application's ability to import and export content has improved. You can import articles from Pocket and Instapaper, as well as articles marked as "To read" in bookmarking service Pinboard. You can also import Firefox and Chrome bookmarks. You can also export your articles in several formats including EPUB, MOBI, PDF, and plaintext. You can do that for individual articles, all your unread articles, or every article—read and unread. The version of wallabag that I used four years ago could export to EPUB and PDF, but that export was balky at times. Now, those exports are quick and smooth. Annotations and highlighting in the web interface now work much better and more consistently. Admittedly, I don't use them often—but they don't randomly disappear like they sometimes did with version 1 of wallabag. The look and feel of wallabag have improved, too. That's thanks to a new theme inspired by Material Design. That might not seem like a big deal, but that theme makes wallabag a bit more visually attractive and makes articles easier to scan and read. Yes, kids, good UX can make a difference. One of the biggest changes was the introduction of a hosted version of wallabag. More than a few people (yours truly included) don't have a server to run web apps and aren't entirely comfortable doing that. When it comes to anything technical, I have 10 thumbs. I don't mind paying € 9 (just over US$ 10 at the time I wrote this) a year to get a fully working version of the application that I don't need to watch over. Overall, wallabag's core functions are the same. The updated codebase, as I mentioned above, makes those functions run quite a bit smoother and quicker. Wallabag's browser extensions do the same job in the same way. I've found that the extensions work a bit better than they did when I first tried them and when the application was at version 1. The mobile app is good, but it's not great. It does a good job of rendering articles and has a few configuration options. But you can't highlight or annotate articles. That said, you can use the app to dip into your stock of archived articles. While wallabag does a great job collecting articles, there are sites whose content you can't save to it. I haven't run into many such sites, but there have been enough for the situation to be annoying. I'm not sure how much that has to do with wallabag. Rather, I suspect it has something to do with the way the sites are coded—I ran into the same problem while looking at a couple of proprietary read-it-later tools. 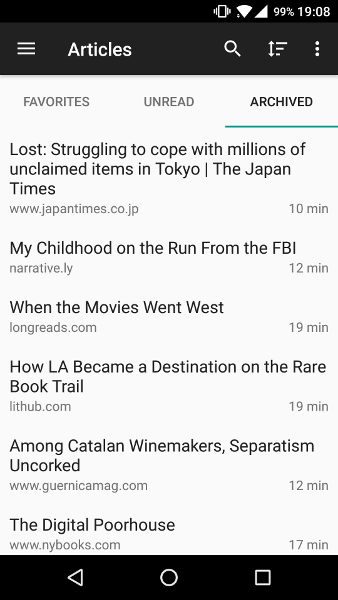 Wallabag might not be a feature-for-feature replacement for Pocket or Instapaper, but it does a great job. It has improved noticeably in the four years since I first wrote about it. There's still room for improvement, but does what it says on the tin. Since 2014, wallabag has evolved. It's gotten better, bit by bit and step by step. 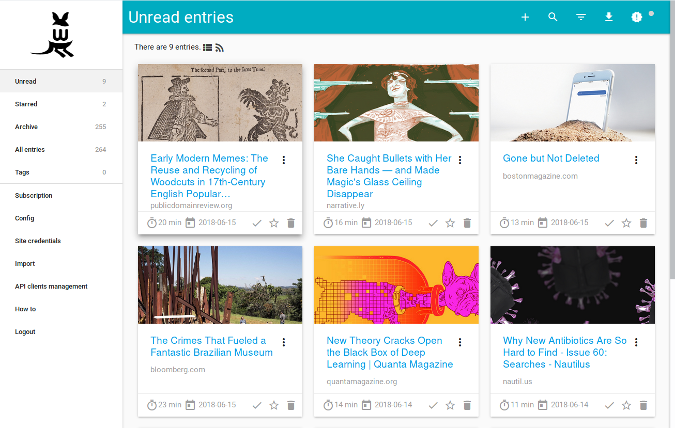 While it might not be a feature-for-feature replacement for the likes of Instapaper and Pocket, wallabag is a worthy open source alternative to proprietary read-it-later tools. I agree that the mobile client is functional but lacking. The think I really enjoyed most about using Wallabag was for collecting those random articles that come up that spark a little curiosity, but are not immediate reads. I found myself building up a back log of these curiosities and never actually reading them. With Wallabag, I addressed it by tagging these articles with a common tag, then at the end of the week, logging into my Wallabag instance, filter for that tag, and export all to PDF. The output was a clean looking single PDF containing all the reads found that week. I would then email them to my Kindle Paperwhite for reading. Once I exported them, I would mark them read and archived so I can reuse the tag for my next week of collecting. My Kindle was easier on my eyes than a phone/tablet/or laptop for the casual reading and I found myself reading these usually forgotten items because I had access to them on a relaxed condition (anywhere). I found myself being able to get engrossed in variety of topics that I normally would not have if I did not create a condition for myself to explore it. Beyond that, Wallabag has not been able to replace traditional bookmarking (though I have tried quite hard). Long since last time I hard about it and that's a good improvement! I like the design and the hosted version sounds neat. BTW could you please make a review of Winds as well? Now your left with something that that you can stash, or use Calibre to convert to epub/mobi/pdf. Not every website is viewable in Reader Mode. I have no idea whether they block it or confuse it. It's not just reader mode. I've run into that problem with other read-it-later tools. Some sites are just coded to stymie those tools. Probably has something to do with being able to track readers, advertising, or some combination of those and other factors.